St James’s Place Charitable Foundation, the philanthropic arm of the St James’s Place Wealth Management Group has donated nearly £30,000 to leading cancer charity, Penny Brohn UK. 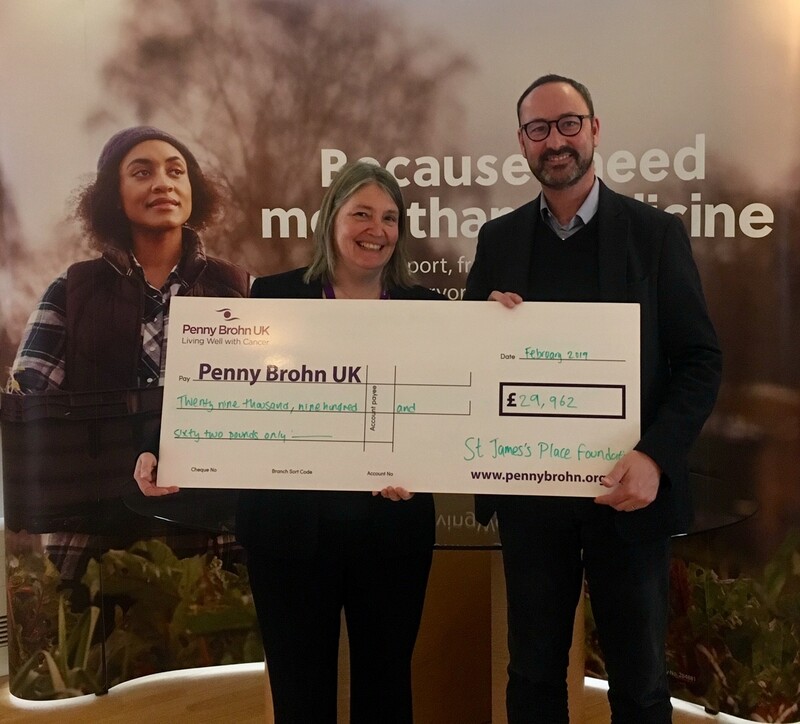 The donation will help fund Penny Brohn UK’s Loneliness Package of Care which aims to create a tailored holistic pathway directly benefitting the health and wellbeing of older people living with cancer who experience loneliness and social or emotional isolation. The project is designed to improve feelings of loneliness which will be monitored by a bespoke evaluation programme delivered by Penny Brohn UK’s Research and Evaluation team. For older people living with cancer, loneliness is a critical problem. There is growing evidence that suggests that improving community involvement in response to loneliness improves the overall sense of health and wellbeing among those facing illness. Penny Brohn UK’s Loneliness Package, supported by the funding from St James’s Place Foundation, will address the psychological and emotional concerns of older people living with cancer through a number of services including: a treatment support clinic; residential courses; weekly peer support groups such as Nordic Walking and Yoga; and counselling. With nearly 40 years’ experience, Penny Brohn UK recognises that people with cancer need more than medicine to live well with the disease. It is the only charity in the UK to take an integrated whole person approach to cancer support using evidence-based therapies that work alongside medical treatment to achieve the best health and wellbeing. For more information about Penny Brohn UK visit pennybrohn.org.uk. * For more information regarding media usage, ownership and rights please contact Penny Brohn UK.